So this year, I’ve been keeping a secret from Sam, a secret but he hasn’t yet found out. Saying that, by the time this post goes live, the secret will be out. This year Sam turns 40. The big 4–0. The one big number where apparently the mid life crisis usually comes from. Thankfully not being able to drive, there will be no buying a Harley or an MG. Instead of the usual where I may make a meal, or we go out for lunch, followed by a few drinks, presents and a big Ol’ slice of chocolate cake, I decided that because it’s a pretty big birthday, I’d go all out. So I was sneaky. I told the people that I needed to. I roped in the people that needed to know, deliberately not telling certain people who are known for not keeping their mouth’s shut and tiptoed around the best part of 9 months with Emily as my accomplice being extra careful that Sam wouldn’t find out. It was quite fun, expensive, but fun. Sam is pretty fussy. He says he’s not but he is. I had to decide on what exactly he may want for his birthday, right down to the choice of gift (s), the birthday, the day, and if anything else that needed to be included, would and who might attend too. And so came the idea, of a surprise birthday party. Which makes sense when Sam hates surprises. But I wanted to make sure that this was a surprise like no other. I had decided on the party idea back in January, but I needed to quietly plan it. I had to think of a theme, organise it, rope in family members that would all keep Sam’s mind entertained with the idea of a boys night and mine that we were going out for the day. 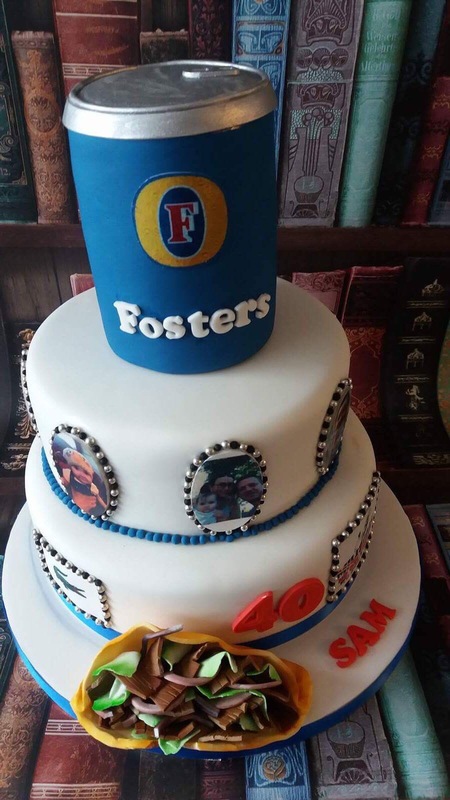 I had to think of an idea for a birthday cake that would suit him perfectly, agree with Emily not to say anything, write a list of who to invite, carefully stalk his friends on Facebook to add to the invite list, arrange a venue, decide on times, music, food, entertainment, and date. It was all so organised of me. I never used to be this organised. Well done me! In July, with most of the items for the theme and birthday perfectly hidden inside a drawer in his mum’s bed, amongst all the party invites on the floor ready to go out, I did a practice run. Whilst Emily jumped in her jumperoo, I set up the front room like a mini pub function room. I laid everything out on the table and imagined what the afternoon would be like with everything set up. My front room is not like a function room, and it’s very different with Mr Tumbles and Emily didn’t want to play ball with this idea either. I have to admit, it’s been pretty difficult trying to get everything right when I can’t say anything to Sam. Anyone who knows Sam, knows when it comes to his birthday, he’ll either is really unhappy no one did anything or really annoyed it’s not what he wanted. You just can’t please some people and this one, well, it’s gonna be tough. I hope he likes it! There was a moment when everything nearly went down the pan in August. Someone mentioned they weren’t invited to his birthday celebrations and irritated that they weren’t included that they felt the need to throw that into the mix, just to be annoying. Thankfully I managed to push the idea to the whole day being a family dinner. Sam, admittedly was miffed that that surprise was ruined, but thankfully still didn’t realise or clock on that it was anything more than a dinner. Phew! There was also another moment when he actually doubted all this and thought it was a joke. That I got my knickers in a twist and decided that let’s be honest time and effort I have, is to waste. I cleared that though up quick. Choosing the venue was pretty easy. I needed somewhere that was family friendly. So I went with The Windmill pub on Newington road in Ramsgate. Since it’s refurbishment earlier this year, it has everything that you need at a family friendly pub – a good sized garden with climbing frame and seating, a good selection of hot, cold and alcoholic drinks, a great British food menu that is both affordable and suitable for all palates for all ages and lots of different events for all ages. At the moment they have a bouncy castle in at the weekends, which is great when dad’s are watching football and mums can have a glass of vino! I’ve stalked, spoken to, laughed with and invited some family and friends from afar. Some of which will be travelling as far as Scotland to join Sam on his big day. There will be some of Sam’s family members that I have never met and friends that I’ve heard about who’ll be coming too. I’m looking forward to everyone who’s coming. So exciting! Sam still has no clue and even when this post goes out, he won’t be reading this post at all. Probably will be walking around with the biggest smile on his face, hopefully. If you’re coming or already here, thanks for coming, if I don’t say it there. My head will be frazzled from running around and getting everything sorted whilst Emily is stuck to my hip. Next Post We’re going on holiday today!